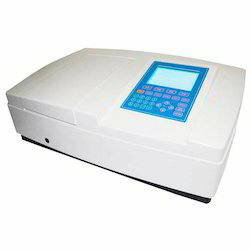 Our honored customers can avail from us a comprehensive array of Spectrophoto Meter. By making use of exceptional quality materials and innovative techniques, the provided meter is developed in strict compliance with global quality guidelines. The performance and functions expected on a micro-Raman spectrometer are all provided with the NRS-5000/7000 series Raman systems, assuring consistent performance for rapid acquisition of high quality data with automated system control and minimal optical adjustments. - Mercury source with 125 watt mercury lamp along with ballast (choke). - Spectrometer unit with inbuilt telescope & collimator, circular scales on both right & left side for measurement of Q1 & Q2 of each colour band. Wavelength range λ=4000 cm-1 to 450 cm-1. The QE Pro-Raman is a preconfigured for 785 nm Raman excitation, using a 900 lines/mm grating and 50 µm slit. To complete your modular Raman system, add a785 nm Raman excitation laser, sample holder, software and other Raman accessories. Our organization is indulged in offering Spark Spectrometer to our clients.